The first thing to be done is to prepare the fiberglass to accept the epoxy. 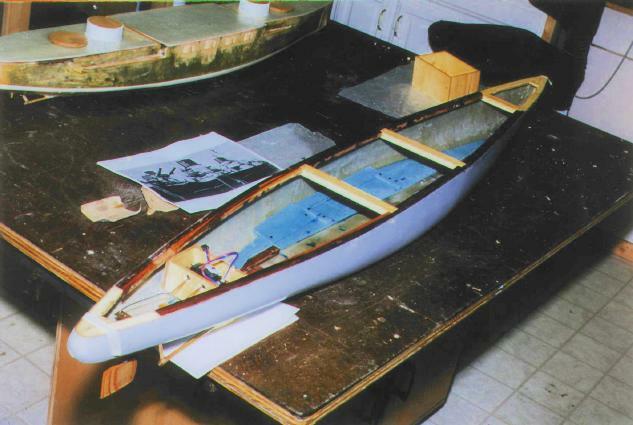 This is done by sanding the interior of the hull with coarse sandpaper to remove the wax-like finish the molding resin leaves behind and to roughen the surface so the epoxy can get a good hold. The important thing to remember when working with an epoxy is surface area and pressure. The more surface area in physical contact, and the tighter those pieces fit together, the better the bond. For the next step, it is important to properly prepare the interior hull near the top edge, for this is where we are going to install the subdeck. First you must decide whether you will make the subdeck in one or in many pieces. The subdeck is a 1/4" thick wood rim around the inside of the ship that helps it keep its shape, adds structural strength, and acts as the support for the main deck. 1/4" thickness is chosen because IR/CWCC construction rules limit the depth of the subdeck and deck to 3/8". Using 1/4" ply for the subdeck allows you to use 1/8" aircraft ply for the deck surface. 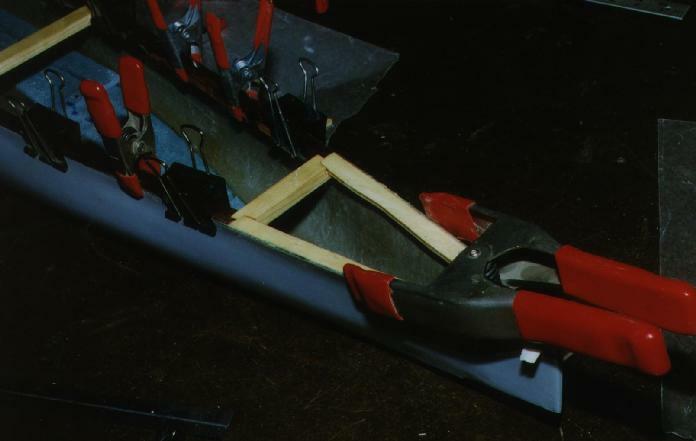 For lateral strength from side to side, cross members are installed to keep the hull from expanding as it is fitted out with gear. 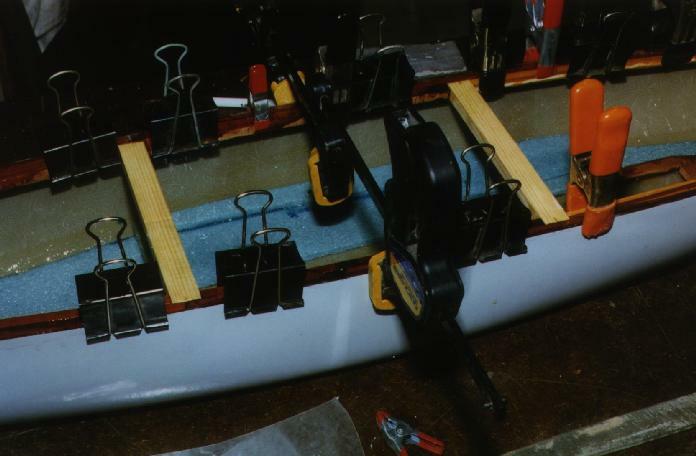 The one piece subdeck has a structural advantage because it is easier to install and has no glue joints that can fail. Go to a store that can do large scale copying and have them copy the overhead section of the plans. 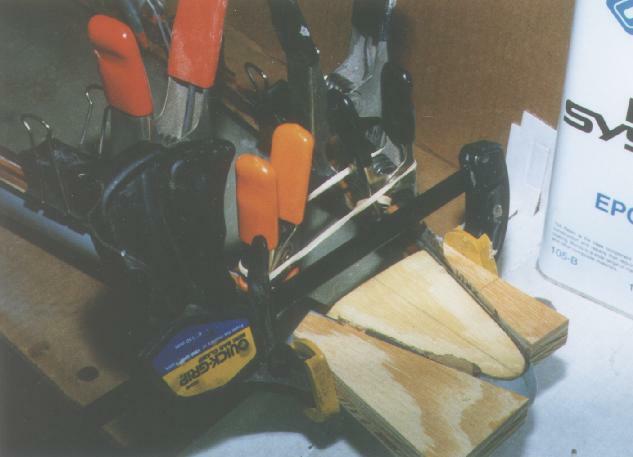 With scissors cut along the outer deck-edge, then glue this to your piece of 1/4" plywood with white glue. 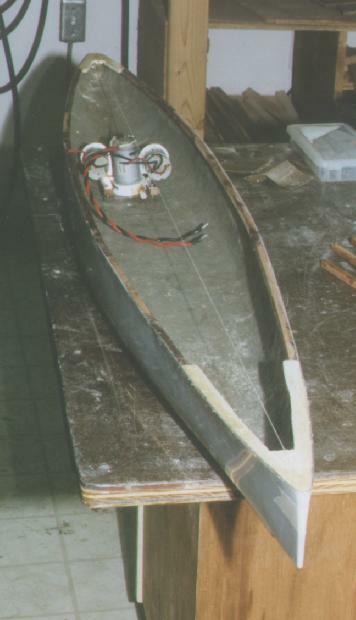 Cut out the plywood along these lines, leaving extra along the edges; this will be removed as you fit it to the fiberglass hull. Draw a line at least 3/8" inside and parallel to the outer deck edge. Decide where you will want your lateral (side to side) supports and draw them. 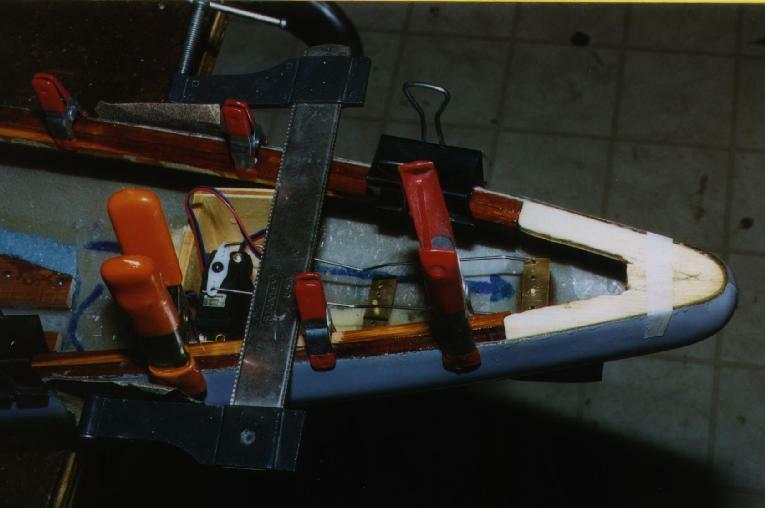 The lateral supports can be as small as 1/4" wide and you should only need four - one near the bow, two amidships and one near the stern. Use a drill with a 1/4" or larger bit to put holes in the corners. Cut between the holes and remove the extra material. 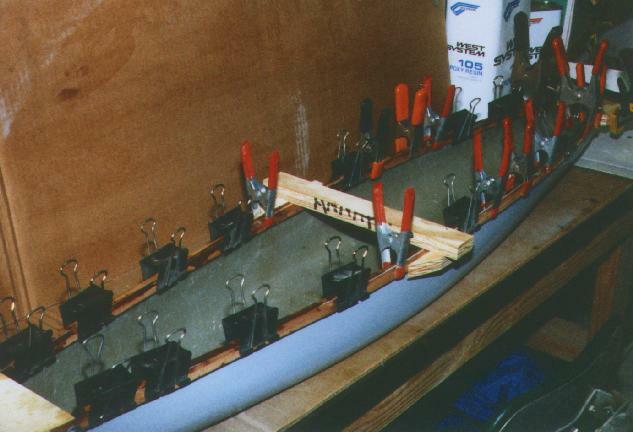 (See Figure A) Test-fit the subdeck (remembering that the hull is bowed outward slightly and will need to be pulled in to get to the correct width) shaping the edge of the subdeck to get the most contact with the inside of the hull. Glue it into place with 24-hour epoxy using the methods I'll describe below. If you don't have a piece of 1/4" ply long enough, you can split the plans and cut the sub-deck out in two pieces and install as shown above. If you can't get large pieces of plywood at all, or have smaller pieces of solid 1/4" slats or planking, you can build the subdeck in pieces. This was the method I used and will describe for you now. Next lets talk about the Bilge Pump.